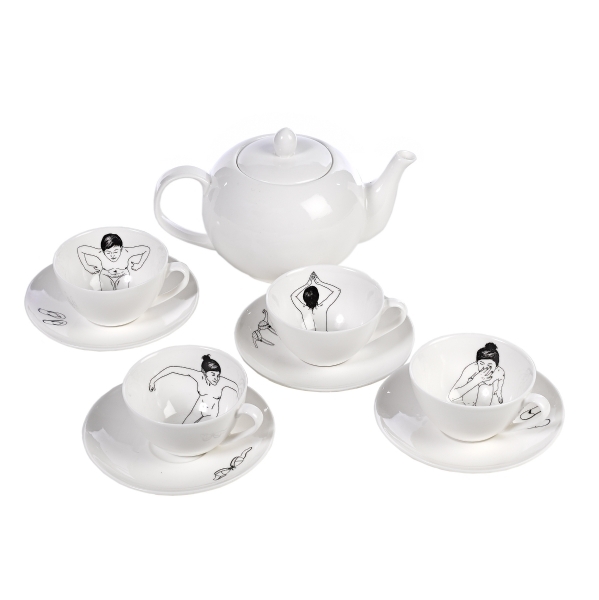 Domestic Sluttery: The Winner of the Dutch By Design Tea Set! You guys really fell for this Dutch by Design tea set, didn't you? We haven't seen you all that excited since you heard you were getting a snow day. Great way to kick off our Christmas competitions. But, our first Christmas competition has been entered, drawn and won! Hurrah! So who won our first prize? Hot chocolate with a shot of rum, whipped cream and chocolate shavings. Sorted. Yep. Sorted indeed. In fact, we might be drinking that for whole duration that it's snowy. Matt, just email us, tell us where to send your prize and then we'll get it whooshed out to you for fancy tea drinking. And the rest of you? Just keep drinking your favourite tipple, and entering all of the other competitions we've got lined up for you! And do pop over to Dutch by Design and check out the rest of their wares, won't you? Talking of tea sets, I am desperately trying to find some red polka dot cups and saucers and matching tea pot for my friend for Christmas...any lesser known websites that anyone knows, who might have some? Hope that does the job! only kidding, congratulations Matt (my teeth are only slightly gritted when I say that). I think you should name all the nuddy ladies and you can choose which one you're going to have tea with. Or that could be a little creepy.